➤ We always need more and more clothes, but can we fit more closets in the room? ➤So the Pants Hanges has arrived!!! 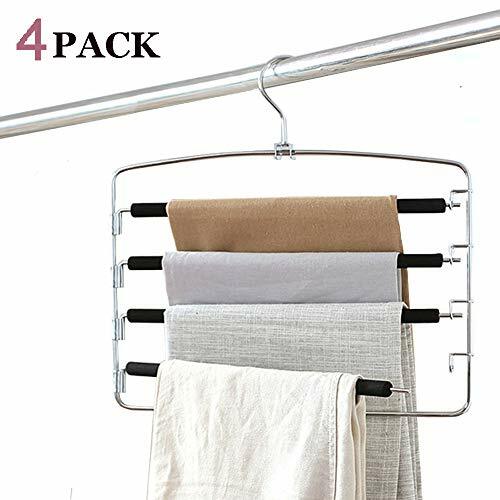 ➤This trousers hangers provide 5 multi-layer organizer to hang all sorts of clothes and laundry. ➤The vertical design will hold them in single spot to saves a lot of space! This hanger is an excellent choice for maximizing space. It can create vertical hanging space in your closet. It hangs up to five pairs of slacks, and features a swing arm mechanism to make removing them easily. Conveniently hangs jeans, trousers, pants, towel, scarf, ties and more. Keep your clothes neat and organized. The stainless steel hooks are finished in shiny chrome,adding to the luxurious aesthetic of the hangers. The hooks swivel 360 degrees making browsing, accessing, and hanging clothes all the more easier. Easy to pack into your garment bag, the trouser hanger is an excellent asset for those gentlemen on business trips who have to say in hotels that don't offer much closets space. Swing arm open for easy access to pants and slacks. Durable chrome steel and foam-padded non-slip bars ,non-slippery and non-creasy.